Hallways can be a difficult area to decorate. You want to make it interesting without overdecorating such a small space. There are ways that you can make your hallway feel as though it blends in with the other rooms in your home. Hallways are great spaces for artwork and family pictures. Hallway decor can be blended in to match with the other decor in your home. You can turn your hallway in to a photo gallery, hanging all the photos in order and at eye level where they have more impact. 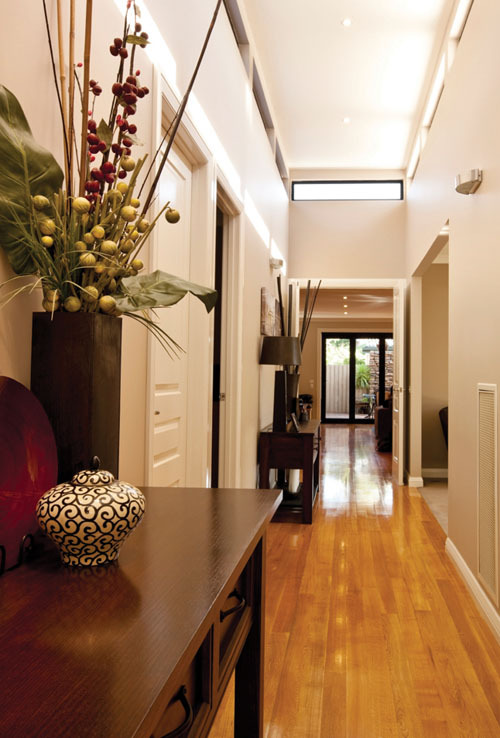 A hallway should be decorated in a way that complements the rest of the design of your home. Putting a couple of large plants at the entrance to a hallway is a very decorative way to make the space pleasant and pleasing to the eye when your enter, giving your hallway a nature theme. Hanging mirrors are also a great way to decorate your hallway. They reflect the other items in the area, making the space look somewhat larger. Mirrors can also give the space a more opened up look. A chandelier will add decorative lighting and will brighten up the space in your hallway. Putting a bench or an additional chair in your hallway will give your guests a place to sit to put on or take off their shoes. Adding a coat and hat rack to your hallway will also be a useful and decorative touch. A small side table with a table lamp on it will also make it look more welcoming, and you can always put this light on a timer so the light welcomes you the minute you come home and creates a presence in the house when you are away. Hallways can be dark. Painting your hallway a light colour can make it brighter and more interesting. You can make your rooms blend in with your hallway area. Paint your hallway the same colour as the adjoining rooms in your home. Make the theme of your hallway have the same feel as the other rooms of your home by continuing the same decor themes from one room to the next. However, depending on how much sunlight your hallway gets, a darker but warmer colour like red or a deep green can offset the lack of light and make it a more welcoming space. If you would like to submit a subject for our articles, please send your request to [email protected] and we will endeavour to answer it.